Don’t treat asymptomatic bacteruria with antibiotics. Inappropriate use of antibiotics to treat asymptomatic bacteruria (ASB), or a significant number of bacteria in the urine that occurs without symptoms such as burning or frequent urination, is a major contributor to antibiotic overuse in patients. With the exception of pregnant patients, patients undergoing prostate surgery or other invasive urological surgery, and kidney or kidney pancreas organ transplant patients within the first year of receiving the transplant, use of antibiotics to treat ASB is not clinically beneficial and does not improve morbidity or mortality. The presence of a urinary catheter increases the risk of bacteruria, however, antibiotic use does not decrease the incidence of symptomatic catheter-associated urinary tract infection (CAUTI), and unless there are symptoms referable to the urinary tract or symptoms with no identifiable cause, catheter-associated asymptomatic bacteruria (CA-ASB) does not require screening and antibiotic therapy. The overtreatment of ASB with antibiotics is not only costly, but can lead to C. difficile infection and the emergence of resistant pathogens, raising issues of patient safety and quality. Don’t use antibiotic therapy for stasis dermatitis of lower extremities. Stasis dermatitis is commonly treated with antibiotic therapy, which may be a result of misdiagnosis or lack of awareness of the pathophysiology of the disease. The standard of care for the treatment of stasis dermatitis affecting lower extremities is a combination of leg elevation and compression. Elevation of the affected area accelerates improvements by promoting gravity drainage of edema and inflammatory substances. The routine use of oral antibiotics does not improve healing rates and may result in unnecessary hospitalization, increased health care costs and potential for patient harm. Avoid testing for a Clostridium difficile infection in the absence of diarrhea. Testing for C. difficile or its toxins should be performed only on diarrheal (unformed) stool, unless ileus due to C. difficile is suspected. Because C. difficile carriage is increased in patients on antimicrobial therapy, and patients in the hospital, only diarrheal stools warrant testing. In the absence of diarrhea, the presence of C. difficile indicates carriage and should not be treated and therefore, not tested. Avoid prophylactic antibiotics for the treatment of mitral valve prolapse. Antibiotic prophylaxis is no longer indicated in patients with mitral valve prolapse for prevention of infective endocarditis. The risk of antibiotic-associated adverse effects exceeds the benefit (if any) from prophylactic antibiotic therapy. Limited use of prophylaxis will likely reduce the unwanted selection of antibiotic-resistant strains and their unintended consequences such as C. difficile-associated colitis. 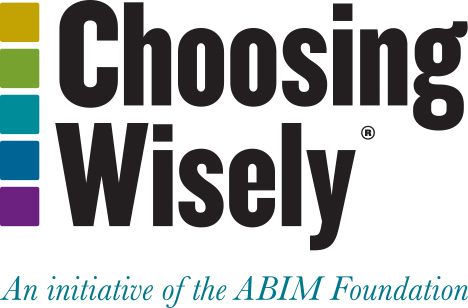 The Infectious Diseases Society of America (IDSA) is proud to partner with the Choosing Wisely® campaign to raise awareness of inappropriate, wasteful clinical actions that harm patients and lead to costly health care. Supporting the aims ofChoosing Wisely, IDSA is committed to evidence-based medicine and develops clinical practice guidelines that inform the use of high-quality, truly necessary medicine. Founded in 1963, IDSA represents more than 10,000 infectious diseases physicians and scientists devoted to patient care, prevention, population health, education and research in the area of infectious disease (ID). Our members care for patients of all ages with serious infections, including meningitis, pandemic influenza, pneumonia, tuberculosis, surgical infections, immunocompromised cancer or transplant patients who have life- threatening infections caused by uncommon or drug-resistant microorganisms, HIV and AIDS patients, and new and emerging infections, such as Middle East respiratory syndrome (MERS), and Ebola. For more information on infectious diseases specialists and IDSA, please visit the IDSA website, www.idsociety.org. The Infectious Diseases Society of America’s (IDSA) Quality Improvement Committee (QIC) directed the development of IDSA’s Choosing Wisely®list of Five Things Physicians and Patients Should Question. The Committee identified a preliminary list of inappropriate and overused clinical practices. A list of five items was drafted and then vetted by the QIC and revisions were made according to a workgroup consensus. The finalized list was then submitted for approval to the IDSA Board of Directors. IDSA’s disclosure and conflict of interest policy can be found at www.idsociety.org/Index.aspx. Trautner B, Kelly PA, Petersen N, Hysong S, Kell H, Liao KS, Patterson JE, Naik AN. A hospital-site controlled intervention using audit and feedback to implement guidelines concerning inappropriate treatment of catheter-associated asymptomatic bacteriuria. Implement Sci. 2011 Apr 22,6:41. Nicolle LE, Bradley S, Colgan R, Rice JC, Schaeffer A, Hooton TM. Infectious Diseases Society of America, American Society of Nephrology, American Geriatric Society. Infectious Diseases Society of America guidelines for the diagnosis and treatment of asymptomatic bacteriuria in adults. Clin Infect Dis. 2005 Mar 1;40(5):643-54. Gross PA, Patel B. Reducing antibiotic overuse: a call for a national performance measure for not treating asymptomatic bacteriuria. Clin Infect Dis. 2007 Nov 15; 45(10):1335-7. Chow AW, Benninger MS, Brook I, Brozek JL, Goldstein EJ, Hicks LA, Pankey GA, Seleznick M, Volturo G, Wald ER, File TM Jr. IDSA clinical practice guideline for acute bacterial rhinosinusitis in children and adults. Clin Infect Dis. 2012 Apr;54(8):e72-112. Zoorod R, Sidani MA, Fremont RD, Kihlberg C. Antibiotic use in acute upper respiratory tract infections. Am Fam Physician. 2012 Nov 1;86(9):817-22. Adult appropriate antibiotic use summary: physician information sheet (adults) [Internet].Atlanta (GA): The Centers for Disease Control and Prevention; 2012 May 1 [updated 2012 Jun 25; cited 2015 Jan 28]. Available from: http://www.cdc.gov/getsmart/campaign-materials/info-sheets/adult-approp-summary.html. Stevens DL, Bisno AL, Chambers HF, Dellinger EP, Goldstein EJ, Gorbach SL, Hirschmann JV, Kaplan SL, Montoya JG, Wade JC. Practice guidelines for the diagnosis and management of skin and soft tissue infections: 2014 update by the infectious diseases society of America. Clin Infect Dis. 2014 Jul 15;59(2):147-59. Collins L, Seraj S. Diagnosis and treatment of venous ulcers. Am Fam Physician. 2010 Apr 15;81(8):989-96. Cohen SH, Gerding DN, Johnson S, Kelly CP, Loo VG, McDonald LC, Pepin J, Wilcox MH; Society for Healthcare Epidemiology of America; Infectious Diseases Society of America. Clinical practice guidelines for Clostridium difficile infection in adults: 2010 update by the Society for Healthcare Epidemiology of America (SHEA) and the Infectious Diseases Society of America (IDSA). Infect Control Hosp Epidemiol. 2010 May;31(5):431-55. Surawicz, Christina M, Brandt LJ, Binion DG, Ananthakrishnan AN, Curry SR, Gilligan PH, McFarland LV, Mellow M, Zuckerbraun BS. Guidelines for diagnosis, treatment, and prevention of Clostridium difficile infections. Am J Gastroenterol. 2013 Apr;108(4):478-98. Nishimura RA, Carabello BA, Faxon DP, Freed MD, Lytle BW, O’Gara PT, O’Rourke RA, Shah PM. ACC/AHA 2008 Guideline update on valvular heart disease: focused update on infective endocarditis: a report of the American College of Cardiology/American Heart Association Task Force on Practice Guidelines endorsed by the Society of Cardiovascular Anesthesiologists, Society for Cardiovascular Angiography and Interventions, and Society of Thoracic Surgeons. J Am Coll Cardiol. 2008 Aug 19;52(8):676-85. Gopalakrishnan PP, Shukla SK, Tak T. Infective endocarditis rationale for revised guidelines for antibiotic prophylaxis. Clin Med Res. 2009 Sep;7(3):63–8.